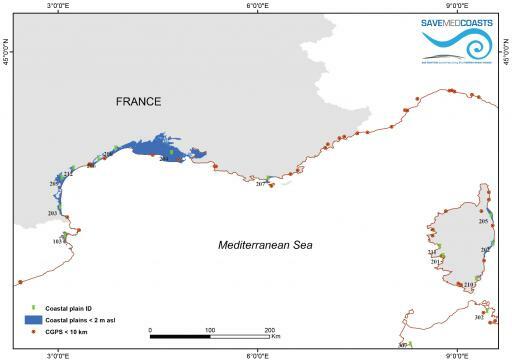 This section reports a set of maps with the location of 163 main coastal plains of the Mediterranean region, as identified from radar data and geo-spatial analysis. The coastal plains placed at elevation <2 m above sea level potentially prone to be flooded due to sea level rise by 2100, storm surges and tsunamis, are shown in light blue. The total exposed area is about 38.529 km2, corresponding to about 5.5 million soccer fields. 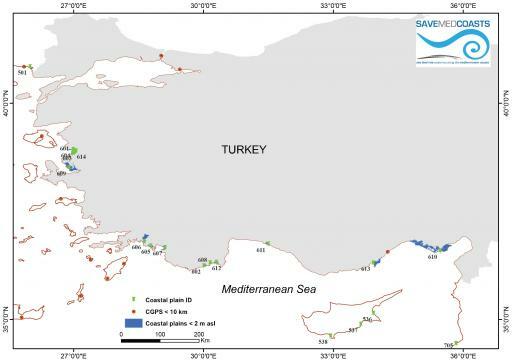 Turkey (ID 600): map of the coastal plains prone to marine flooding. In blue are the coastal plains with elevation less than 2 m above sea level. Tunisia (ID 800): map of the coastal plains prone to marine flooding. In blue are the coastal plains with elevation less than 2 m above sea level. 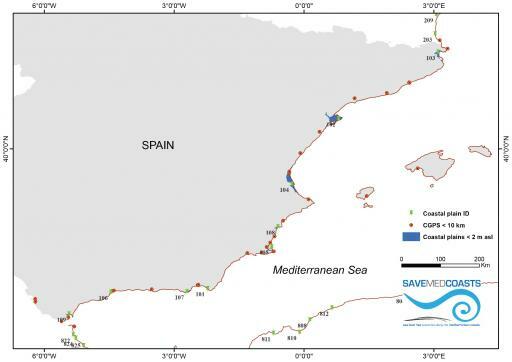 Spain (ID 100): map of the coastal plains prone to marine flooding. In blue are the coastal plains with elevation less than 2 m above sea level. 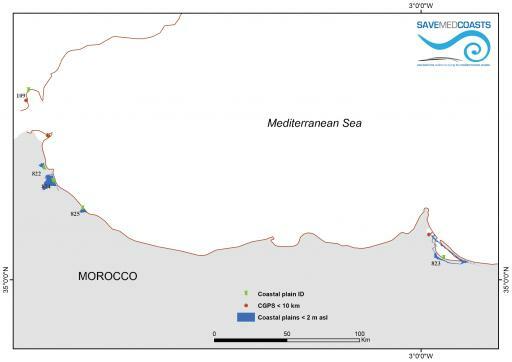 Morocco (ID 800): map of the coastal plains prone to marine flooding. In blue are the coastal plains with elevation less than 2 m above sea level. 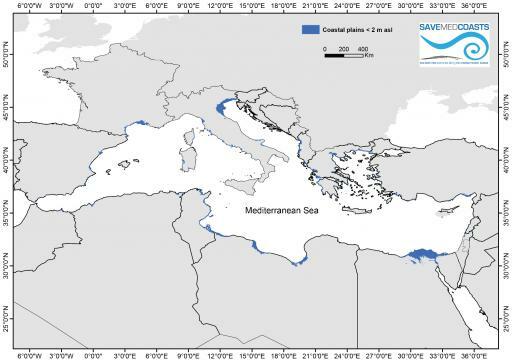 Map of the coastal plains prone to marine flooding in the Mediterranean region. In blue are the coastal plains with elevation less than 2 m above sea level. 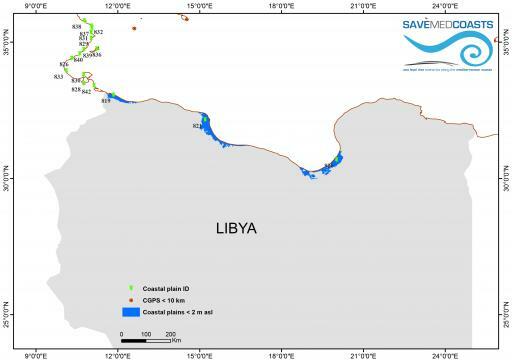 Libya (ID 800): map of the coastal plains prone to marine flooding. In blue are the coastal plains with elevation less than 2 m above sea level. 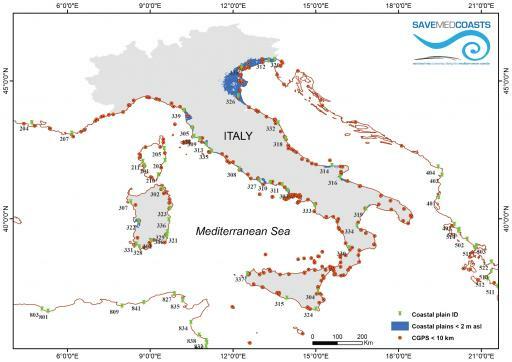 Italy (ID 300): map of the coastal plains prone to marine flooding. In blue are the coastal plains with elevation less than 2 m above sea level. 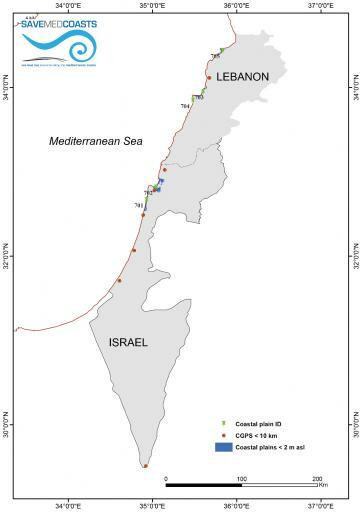 Israel and Lebanon (ID 700): map of the coastal plains prone to marine flooding. In blue are the coastal plains with elevation less than 2 m above sea level. 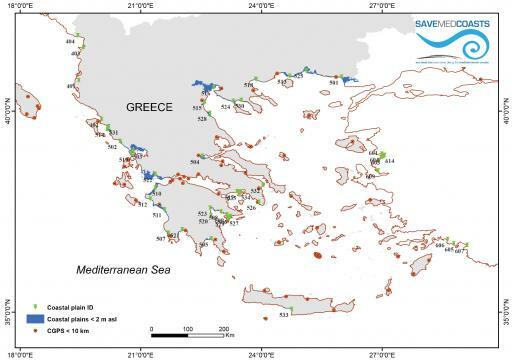 Greece (ID 500): map of the coastal plains prone to marine flooding. In blue are the coastal plains with elevation less than 2 m above sea level. France (ID 200): map of the coastal plains prone to marine flooding. In blue are the coastal plains with elevation less than 2 m above sea level. 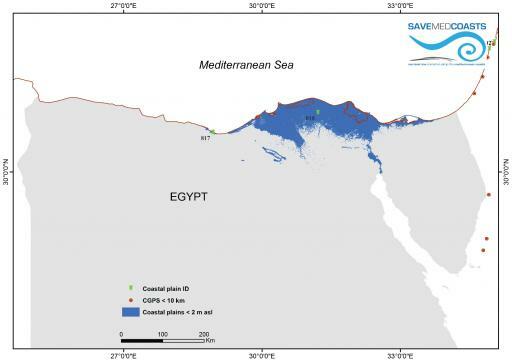 Egypt (ID 800): map of the coastal plains prone to marine flooding. In blue are the coastal plains with elevation less than 2 m above sea level. 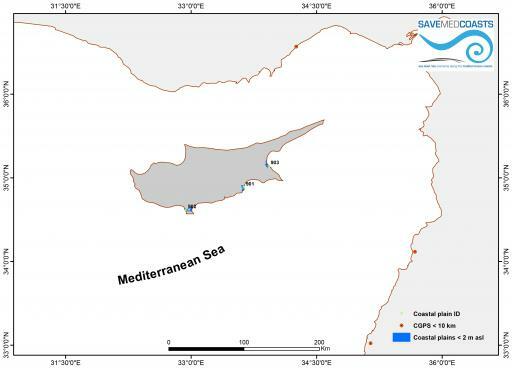 Cyprus (ID 900): map of the coastal plains prone to marine flooding. In blue are the coastal plains with elevation less than 2 m above sea level. 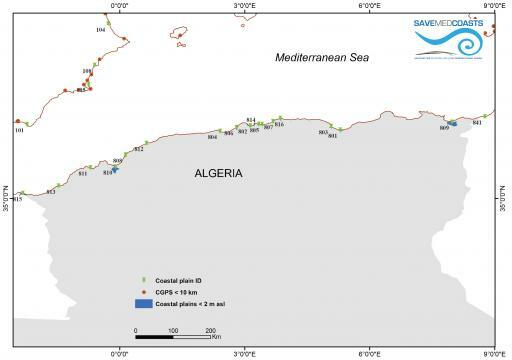 Algeria (ID 800): map of the coastal plains prone to marine flooding. In blue are the coastal plains with elevation less than 2 m above sea level. 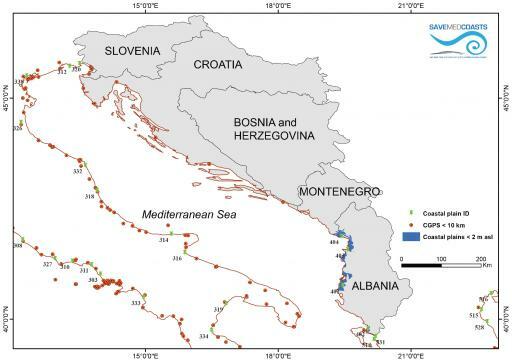 Slovenia, Croatia, Montenegro, Albania (ID 400): map of the coastal plains prone to marine flooding. In blue are the coastal plains with elevation less than 2 m above sea level.